Late last month, we said that the Steam version of Prime World would launch in the middle of September. Unfortunately, that time has come and gone. If you’re wondering why we didn’t launch at that time, we ran into a few issues. We are working to fix these issues before inviting people to play the game on Steam. First impressions are important. You may notice these issues if you attempt to access the current test version of Prime World on Steam, which can be found by searching for Prime World specifically. Once we have resolved the major issues, Prime World will become globally visible to all Steam users just before we make a huge push with Steam featuring, press reviews, major marketing, and more. 1) The launcher is in Russian. To fix this, right-click on Prime World in your library, click Properties, go to the Languages tab and select English. 2) Prime World keeps re-downloading a patch whenever I load the launcher. Download this file. Replace your deployment.dat file with this one in X:\Steam\steamapps\common\PrimeWorld. 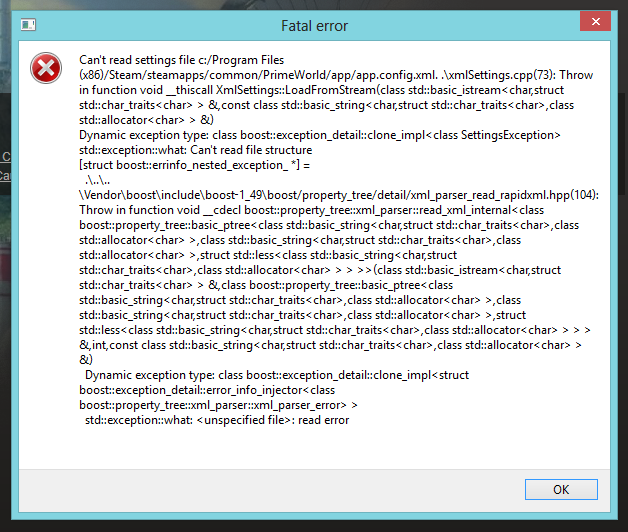 3) Launcher gives a large error. Add https://dl.dropboxusercontent.com/u/223240/app.config.xml and https://dl.dropboxusercontent.com/u/223240/app.dat to X:\Steam\steamapps\common\PrimeWorld\app. 4) The Looking for Group chat is missing. We are currently working to fix this. If you encounter an issue not listed here, please report it to our forums. As we work towards our Steam launch, we will continue to keep you updated on the progress. We’re really excited to bring more people into the game, and this is just the beginning. We have more plans to bring new players into Prime World beyond Steam.